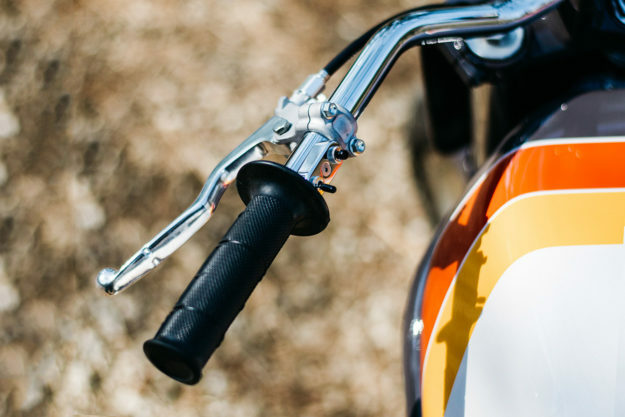 There’s a huge flat track resurgence happening right now, and it’s spilling over into the custom domain. Even if most of the tracker-style builds we see aren’t actually destined for oval track glory, there’s something about the vibe that people love. 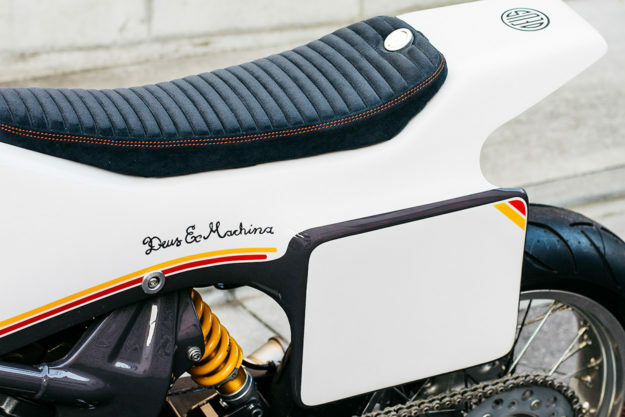 The head wrench of Deus Ex Machina Tokyo is a massive fan: “There is something magnetic about the image of a flat track rider exiting a turn,” Matt Roberts enthuses. So it’s no surprise that the latest build from ‘The Residence of Impermanence’ is dripping with flat track steeze. What is surprising, though, is the choice of donor. 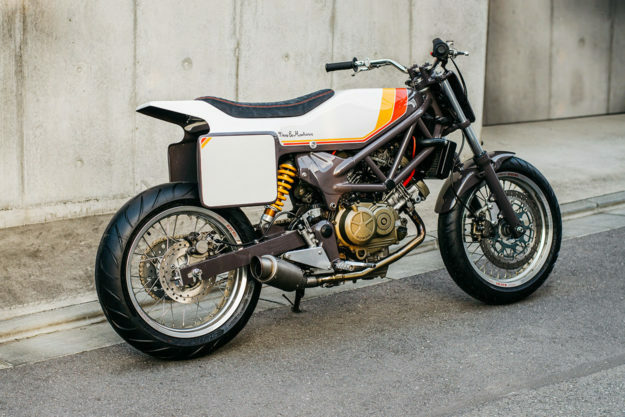 No, it’s not a baby Ducati Monster (we had to do a double take). It’s the lesser known Honda VTR250. It’s big in Japan, but Honda never sold it in the States, and only started exporting it to Europe in 2009. In the late nineties Honda’s 249cc V-twin screamer was raced, scratched and toured across Japan, and thrashed mercilessly at the hands of a legion of Tokyo couriers—invaluable combat testing. “The little V-twin pulls harder than it has any right to,” says Matt. “It’s a fiend for high revs and handles better than many bikes with twice the specification.” The rev-happy pistons willingly spin upwards of 12,000rpm, with the soundtrack and poke to match. 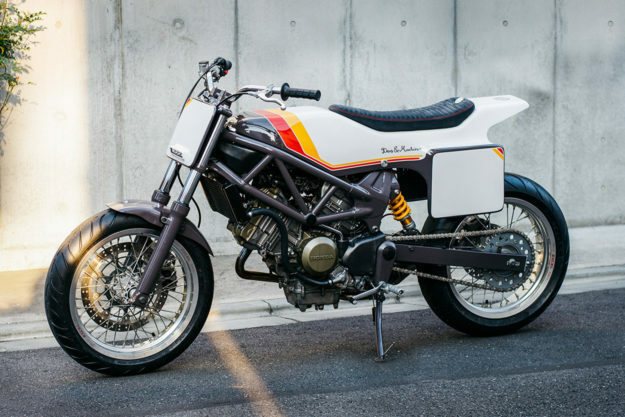 The Ducati-esque trellis frame is another of the Honda VTR250’s selling points, but it makes customizing a chore. 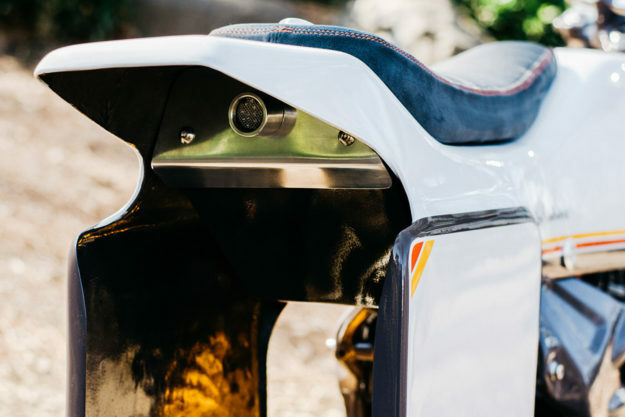 A simple tank swap is out of the question—especially since a chunky air box takes up most of the space under the existing tank. 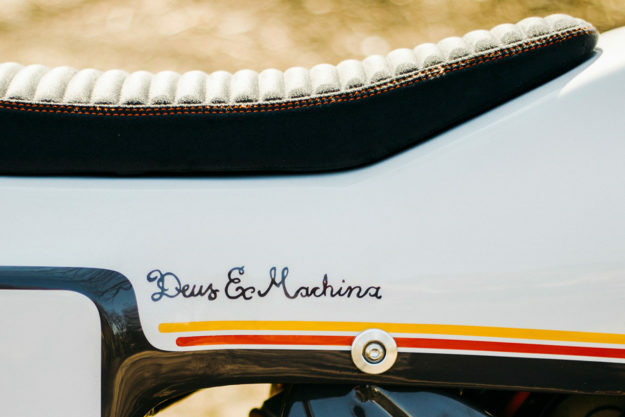 So Deus kicked off the build on good old paper, and sketched out a new monocoque body. Then a mockup was hand-shaped, before the final form was made using a carbon fiber, woven glass and epoxy composite. 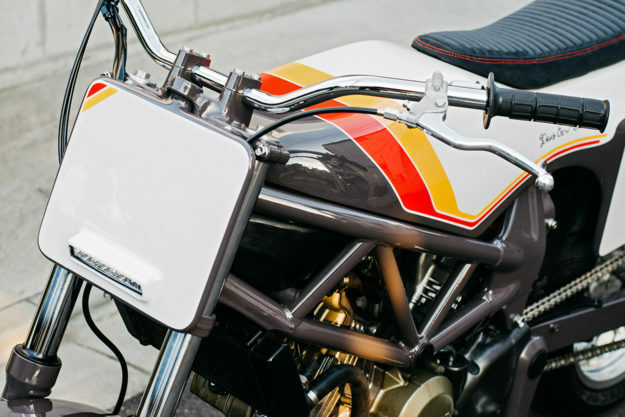 Matt’s drawn inspiration from modern flat track machines, but his thinking was also influenced by the past—borrowing lines from 1970s Champion-style fuel tanks and seat units. It took a while to finalize the layout, though. Plan A was to ditch the airbox and CV carbs, fit flat-slide carbs with filters, and stick a fuel cell in the now open space. But the little twin had other plans. “The flat slides were a dream at full noise,” says Matt. “But we couldn’t get them set up for any useful gains without upsetting the VTR’s bottom and mid range.” So it was hats off to Honda’s 1990s R&D department: The air box and factory carbs were returned, and the build sent back to the drawing board. The solution involved junking the back half of the bike, and fabricating a cantilevered fuel cell that now doubles up as a subframe. 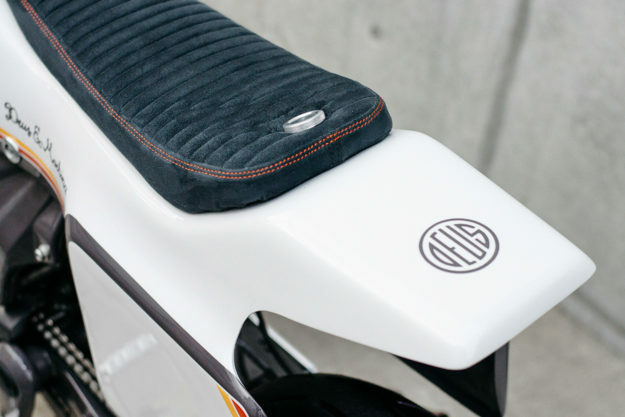 Access to the filler cap is under the seat, which pops off via a neat custom-machined quick-release fastener. The seat itself is an Alcantara affair on an alloy pan, with a burnt orange stitching accent to complement the Honda’s livery. Next up: ergonomics. 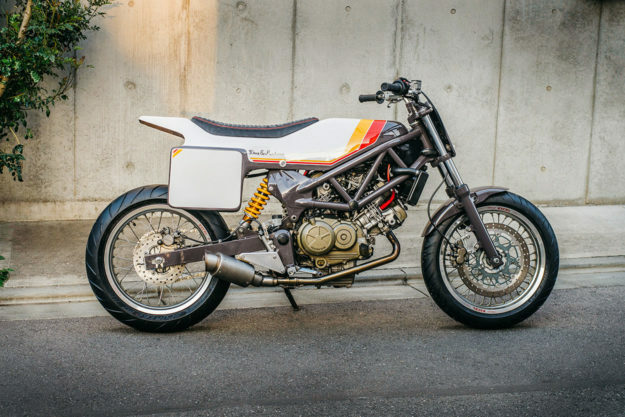 Deus kitted the VTR250 with a new set of flat track bars, then repositioned the foot pegs. They’re now 130mm further forward and 40mm down from stock, to give the control you need if the rear tries to overtake the front. Then there’s the exhaust system, consisting of stainless headers from Mugen, complete with a honeycomb-style insert just behind the two-into-one joint to create backpressure. The stainless steel end can is a one-off; Matt hesitates to call it a silencer. “It’s ‘delightful’ or ‘raucous,’ depending if you’re asking the rider or the neighbors,” he jokes. Even though Matt will be getting the Honda dirty, he knows it’s going to spend more time dodging manhole covers on Tokyo’s greasy streets. So he’s treated it to a set of 17” alloy race rims from Exel, laced to Honda hubs and wrapped in Metzeler Sportec M7 RR tires. He’s upgraded the brakes too, with a 320mm front disc and a mix of Nissin and Brembo components. The final piece of the puzzle is sitting up front: a handcrafted aluminum number board with an embedded LED spotlight, giving ‘South Paw’ its race face. 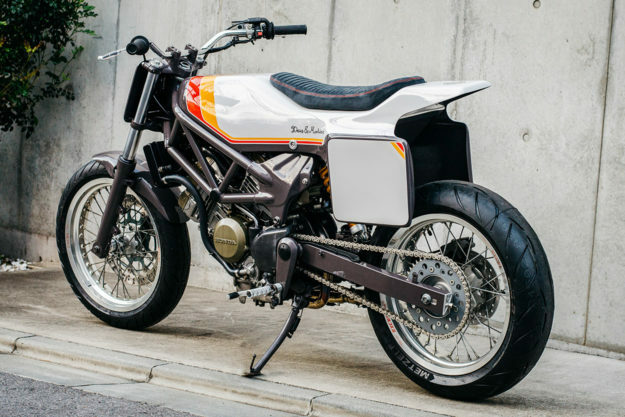 But that’s where the street-legal check list runs dry; Deus have a Motogadget speedo and the necessary running lights waiting to be fitted. When they’re all in place, the ‘South Paw’ will be ready to tear up the streets as only a tracker can. 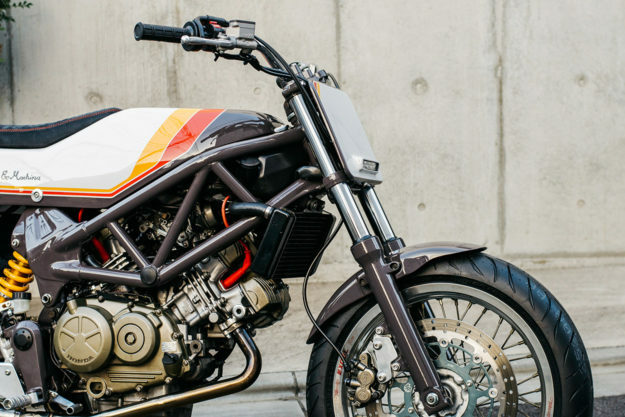 “I’d say for the big city, the tracker-with-17s combination is the most perfectly weaponized form of the internal combustion engine on two wheels,” says Matt. Special Thanks: Nakata-san for the lacquer magic, Miauchi san for the stylin’ suede work, Metzeler Japan for the sticky hoops, Kono-san the fixer.